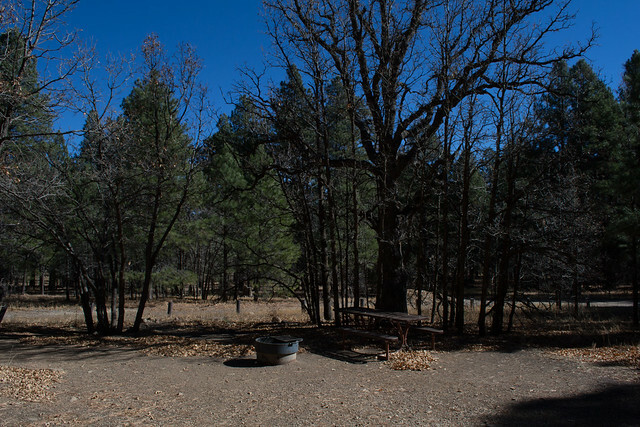 Campsites are scattered through cool groves of ponderosa pines and white firs. Recreational interest here usually centers around fishing in nearby Mormon Lake (when there is water in it), but even if you don't fish there are plenty of things to do in this picturesque area. Wildlife and bird watching are popular activities in this area as they visit the spring. Some of the birds you may see are hawks, northern harriers, an occasional bald eagle and a variety of song birds. The area also boasts a healthy population of elk and mule deer. Campground roads and parking spurs are gravel. Group and single family site reservations accepted online at Recreation.gov or call 877-444-6777 (toll free number), TDD at 877-833-6777. Campsite: $21.00 per night, up to eight people with one vehicle. Second vehicle per night: $8.00 additional. Group site: $115.00, up to 40 people and eight vehicles. Dairy Springs Group has two sites; reservations are required for group sites. Tents and small motor homes up to 35' are permitted at both campgrounds. Location: 24 miles south east of Flagstaff near Lake Mary. Elevation is 7,000 feet. Access: Drive south from Flagstaff 20 miles on Forest Highway 3 (Lake Mary Road) to the intersection of Forest Road 90. Turn west on FR 90 and drive 3.5 miles to Dairy Springs Campground.